The Samsung Galaxy S4 mini measures 124.6 x 61.3 x 8.9 mm, and it's quite surprising actually how much smaller it is than the flagship. More importantly though, the Galaxy S4 mini is nearly the same size as a Galaxy S III mini, thinner at that, while offering a bigger screen of higher-resolution. Not a bad way to start. The Samsung Galaxy S4 mini is a downsized replica of the flagship and the less imposing physique has lost some premium feel. On a positive note, the Galaxy S4 mini is very comfortable to hold and operate single-handedly. And it doesn't look bad after all, particularly for a mid-range device. It's just that the competition too has adequately powered and seriously good looking alternatives in the midrange. The likes of Sony Xperia SP, the LG Optimus F7 and a few Nokia Lumias will be a major source of pressure. Looking exactly like the top dog won't guarantee the mini anything but it seems Samsung is not taking it for granted this time around - like they did with the S III mini last year. Anyway, let's take a good look at the handset. Bellow the display you get the usual three keys: capacitive Menu and Back buttons and a regular press Home key. Above the display we have the earpiece, as well as a bunch of sensors. Other than the traditional ambient light and proximity sensors, there should be an IR gesture too to pick up the cool Air gestures in applications such as the web browser and music player. There's also a 1.9 megapixel front-facing camera for video-calls. The left side of the Samsung Galaxy S4 mini is where the volume rocker is located. On the right side there's only a power key. 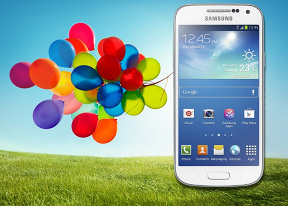 Considering the original Galaxy S4 hasn't got a dedicated camera key, we couldn't possibly expect to find one here. The top of the Galaxy S4 features the 3.5mm audio jack, the secondary microphone and the IR blaster that allows you to use the smartphone as a remote control for your home appliances. There's also a feature-rich remote control app, so the functionality is available right out of the box. The microUSB port resides alongside the primary microphone at the bottom and is used for both data connections and charging. USB host and MHL are not supported. Around the back, the Samsung Galaxy S4 mini sports an 8MP camera, capable of recording 1080p video, and a LED flash below its lens. The loudspeaker grille is in the bottom left corner. The package is powered by a 1900mAh battery. The microSD card slot and the microSIM compartment are located under the battery itself, so hot-swap is not an option.